This post is sponsored by Blue Apron. Make sure to keep reading to score a $40 off discount deal! Hope you all had an amazing weekend! I was in Portland with my girl friends getting in some last solo time away before the baby comes. With all of our trips and plans mostly behind us now (no more travel for me! ), reality is starting to sink in that this is really happening, and it’s happening pretty soon. There are some basic home life things I’d really like to get more organized before our new arrival. I know life will be chaotic afterward, so the more I can do now the better. This isn’t our first rodeo! One of the areas where I’m really struggling right now is meal planning. I’m a good cook and I know plenty about nutrition, so I’m not sure why I’m in such a rut right now. I’ve just been feeling really uninspired and bored with our regular staples. I’ve also really been struggling to get grocery shopping done. I’m managing our business now full time but crammed into the part-time hours I’m available, and so all of my previous time for things like basic errands has gone by the wayside. I’ve had to prioritize and outsource where I need to, and convenience has become key in many areas of household management. Right now I get all of our groceries from Imperfect Produce, Amazon Fresh pickup, and Instacart (Costco). And so it makes sense that I’m not feeling super motivated to cook or meal plan when I’m not spending any time in grocery stores, inspired by new ingredients and fresh ideas. We did a Blue Apron box last week and it was a much needed breath of fresh air! There are now 8 recipes to choose from each week (instead of 6) and you can now choose any combination of recipes you’d like – meaning a combo of meat, veg, fish – whatever suits your family and your diet! There are recipe collaborations featuring things like AirBNB chefs, recipes from the Top Chef winner, and new recipe tags like Mediterranean diet, easy cleanup, and 30-minute meal. Our first meal this week was made on a night when I absolutely did NOT feel like cooking. Even glancing at the Blue Apron ingredients in my fridge had me wanting to just pour a bowl of cereal and call it a day. But I decided to look through the recipe cards just in case there was something that I could throw together quickly. Sure enough, I was immediately drawn to the Quick Buccatini with Broccoli & Pecorino Cheese. Thirty minute meal – count me in! It was so quick and so easy, and also made huge portions for both me and Casey. 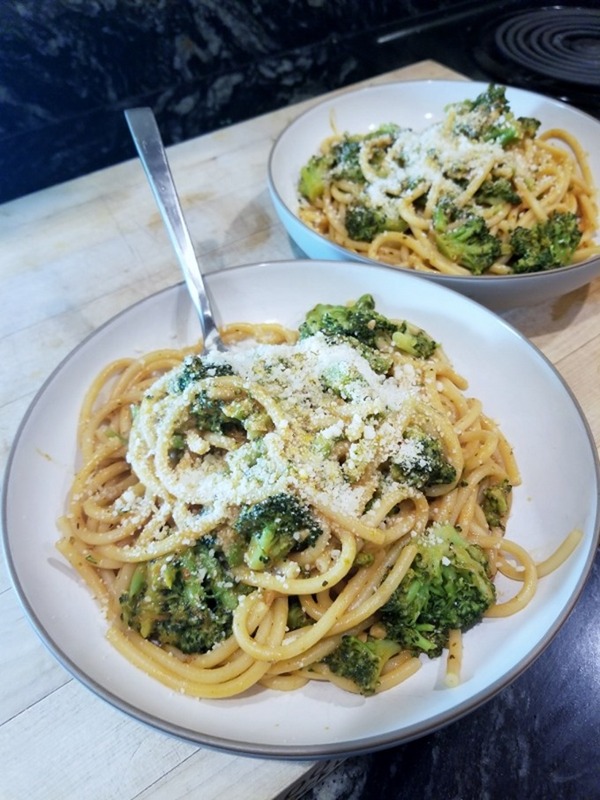 I would never have thought to blanch broccoli in with my pasta as it cooked, and it really cut down on both cooking time and dishes (since I only used one pot). This was on the table in way under thirty minutes, and I was so glad I’d made a proper meal after all. The following night was the end of a stretch of late days for Casey, which meant I’d been cooking and doing solo bedtime for too many days in a row. I announced that I was not cooking dinner and was going to sit on the counter with a scary eye mask on instead, while I watched him cook. He was happy to jump in and take his turn with the next recipe. The only thing better than a yummy homemade meal is when someone else is doing the cooking for you. 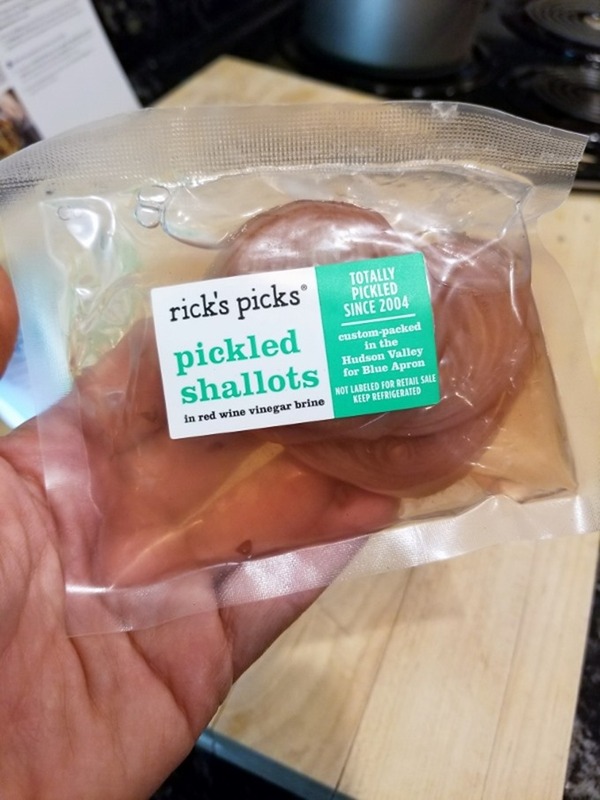 I thought it was cool that these pickled shallots were individually packaged like this, and made specifically for Blue Apron! I will admit that I was not super excited about this meal. I am generally not a quinoa fan – I just can’t get into it. And we never eat bell peppers since Cullen is allergic to them, so it wasn’t a very familiar flavor profile. But put an egg on top and I’ll try just about anything. It ended up being delicious – a really tasty, tangy vinaigrette that perfectly masked all the things I don’t like about quinoa. 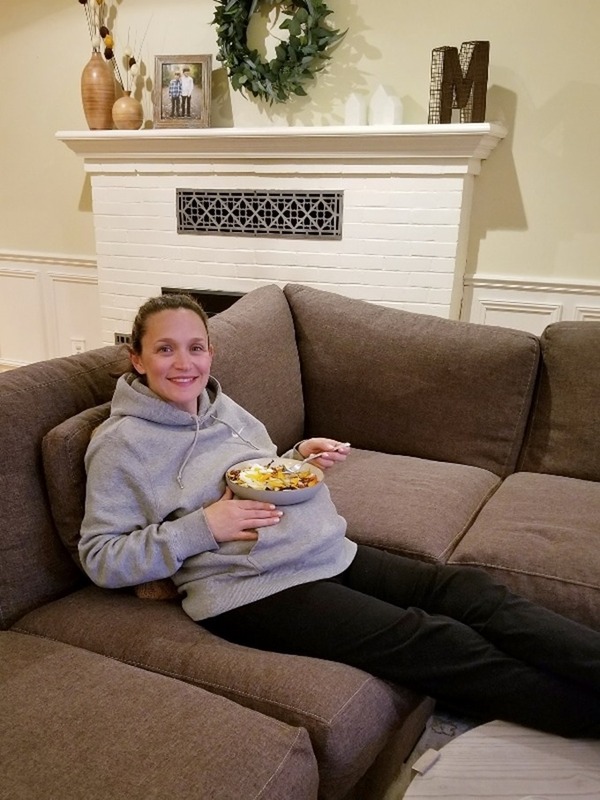 And my giant stomach provided a perfect perch for my bowl – a win, win. 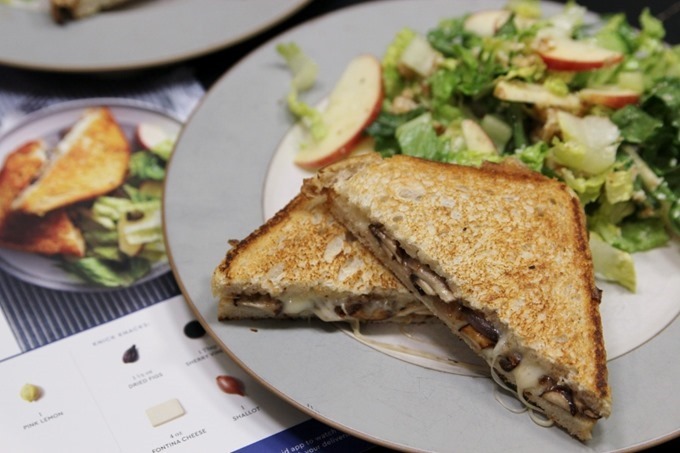 Last but not least, we made Mushroom & Fontina Grilled Cheese with Fig & Apple Salad. We didn’t end up having time to cook this meal before we left for Arizona, so we made it the night we got home – eight days after our box initially arrived. 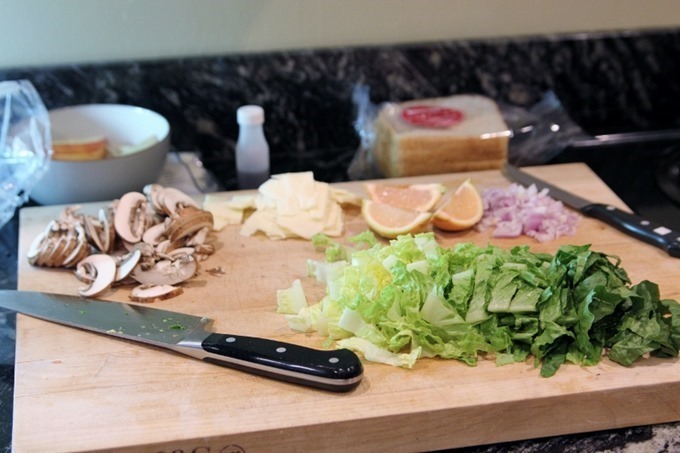 I was seriously impressed with how fresh and crisp the fresh ingredients had remained – even lettuce greens! 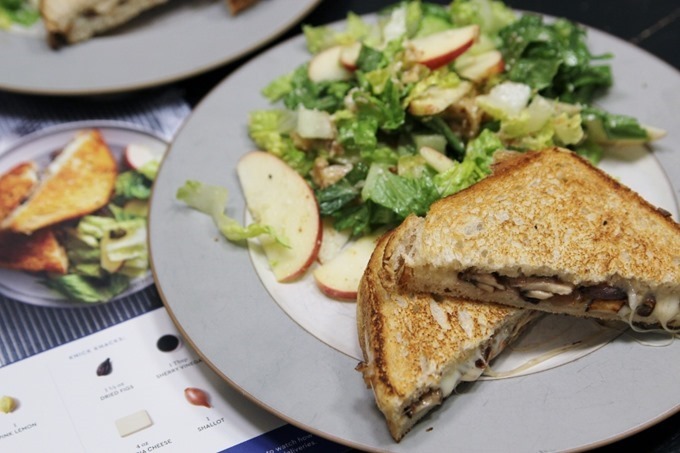 This was another meal that was super quick to throw together – a fancy adult version of grilled cheese with a big tasty salad. 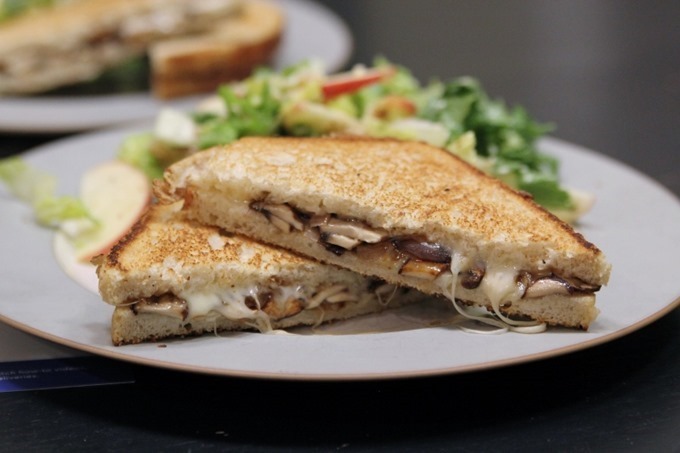 The fontina melted perfectly for the ultimate gooey sandwich – definitely using that for our grilled cheese sandwiches in the future. The salad was delicious and a great light compliment to a slightly more decadent sandwich. It was such a nice break from our rut to have a few fresh and inspired meals, and some good ideas (veggies tossed into pasta and grilled cheese – yes!) to take forward into our next few weeks of meal planning. 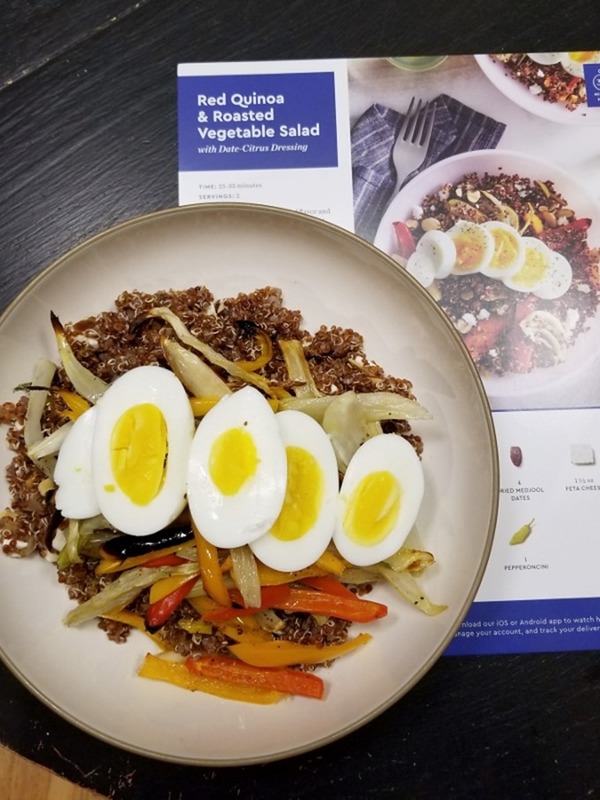 If you haven’t tried Blue Apron yourself, it’s time! The first 25 readers will get $40 off their first two weeks of Blue Apron! Just click here! Can’t pass up a great deal like that. 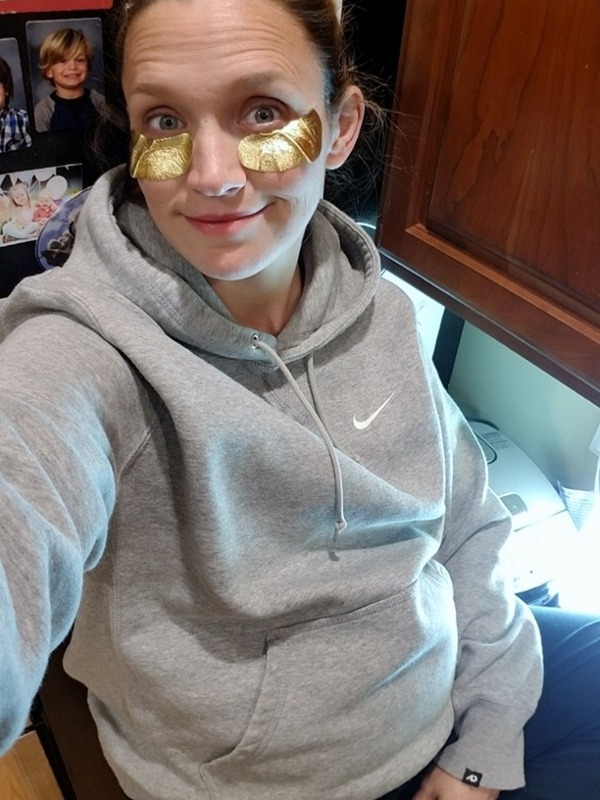 Up next, a pregnancy update post – I better get another one in before the end. 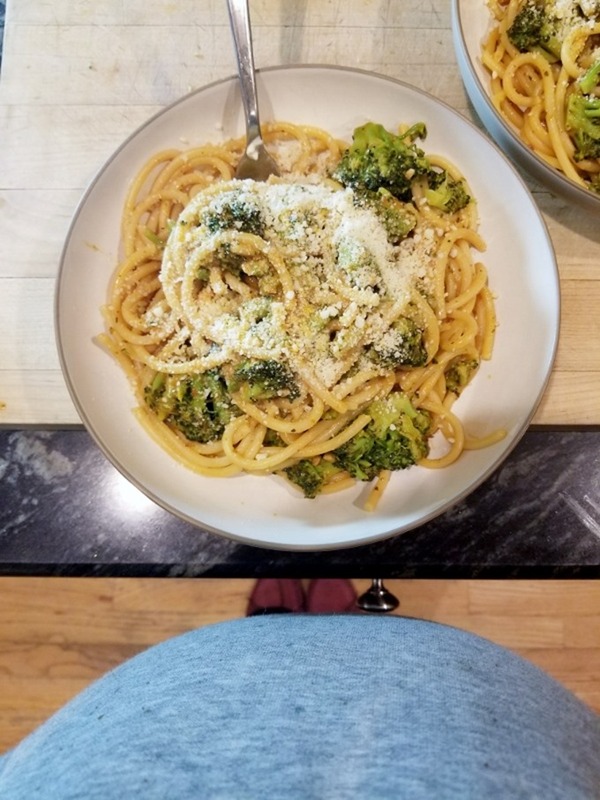 33 weeks has arrived – eeek! Next Post » Ready or Not: Full Term! 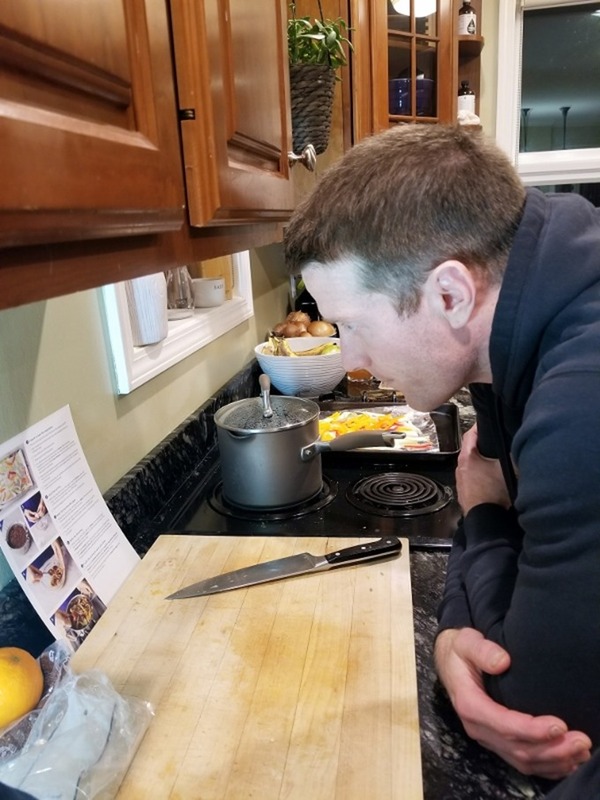 Big blue apron fans over here – been doing it about 2 years now! One thing I will say – if you eat meat like we do – it’s usually best to cook meat-centered dishes in the first 5-6 days at most. I’ve had meat go bad more than once if I go more than that. I had the same bucatini meal – did yours not come with tomato paste or did you opt not to use it? Since you’re a vegetarian you might not use this but I started liking quinoa when I made it with broth from my baked chicken, so maybe a vegetable base broth would work well for you? Anyway, love your blue apron posts. They’re inspiring! Such a great idea. I actually make quinoa bowls with the miso ginger broth from trader Joe’s. Throw in edamame, pistachios, and diced peppers… Yum!